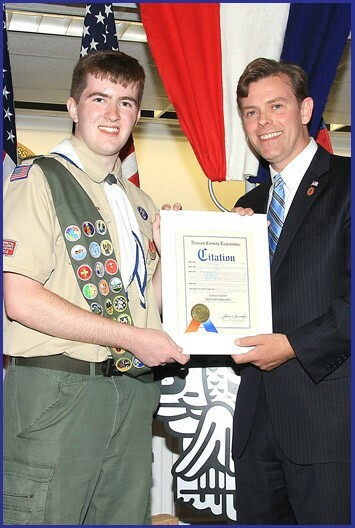 Nassau County Legislator James D. Kennedy offered congratulations and presented a Legislative Citation to Brendan Maloney of Massapequa Park Boy Scout Troop 339 for achieving the rank of Eagle Scout, the highest and most prestigious rank within the Boy Scout organization. For his Eagle Scout project, Brendan renovated an unused portion of land currently owned by the Ancient Order of Hibernians in Babylon, cutting down overhanging branches and mending the grass in the area. As a finishing touch, he built a horseshoe pit for everyone in the community to enjoy.